Tetris is a very popular classic game. The way to play it is pretty simple, by arranging the various tetris bars so that when they have fallen, they fill all the gaps at the surface. If a row is entirely filled horizontally, the row will be removed and there will be more spaces at the top. For this reason, in order to play longer, you must think fast and organize the position and form of the falling tetris blocks to reach all empty areas. Don't let them pile up or you're going to lose. 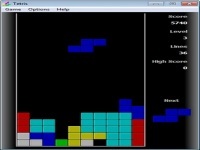 This game is created based on the original tetris game by Alexey Pajitnov. Left/right arrow key = Move. Up arrow key = Rotate. Spacebar / Down arrow key = Drop. Make an aquarium looks beautiful with fish and ornaments by solving the puzzle. Shoot colored balls in this Zuma/Luxor-like game.